Video is a powerful medium. We spend almost three times longer on web pages with video than on ones without. So why not harness the power of video in the emails you send to your list? 12 Brilliant New Clay Scenes! So far, the marketing results are promising! Just using the word video in your email subject line increases open rates by 19% and click-through rates by 65%. But it’s not all sunshine and virtual roses. The easiest way to share a promo video with your email list is to embed it. The problem is that most big email providers like Gmail, Outlook and Yahoo don’t support embedded video. If you take that path, you don’t just risk sending your list a video they can’t play - you also increase your chance of ending up in the spam folder. So, while embedding a video does improve the user experience, the cost can be too high. 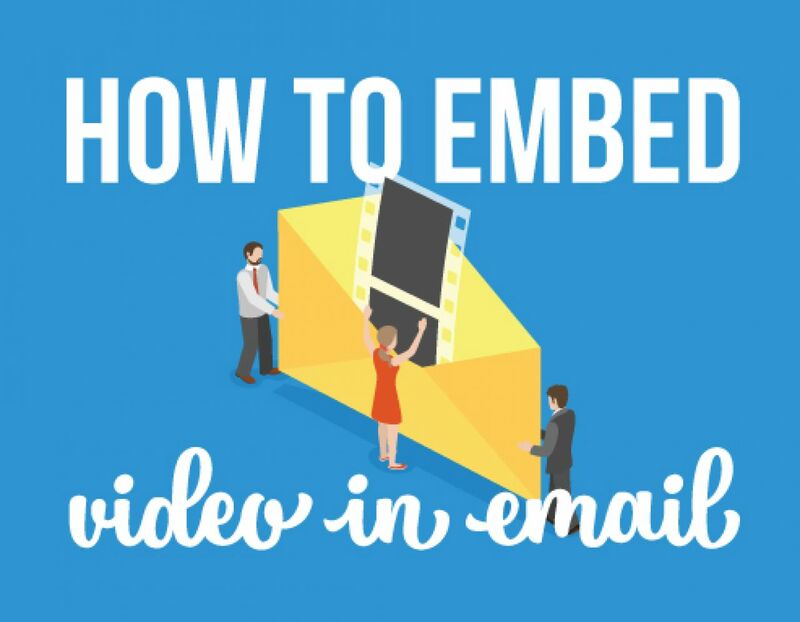 We’ve shared how embedding a video directly into the emails you send can hurt your open rates and land you in the spam folder. Now we’ll share how you can use video in your emails and avoid the penalties! Ready? Meet the two step image/link workaround, the simple solution that gives you the best of both worlds. First, you need to create an appropriate thumbnail for your video. It can be a screenshot of the first scene, a cover or a specially designed graphic. The key is that it sets clear expectations about the video and entices the reader to hit the play button! 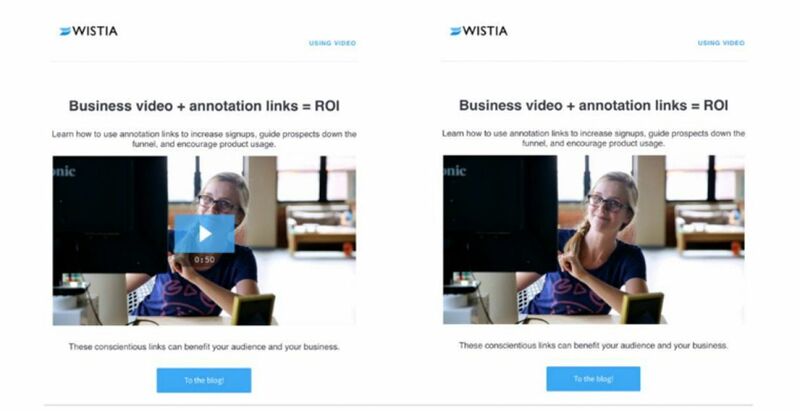 Speaking of play buttons, the Wistia team ran a series of A/B tests to check which performed better: a pure video screenshot or an image that looked like the first shot of a traditional video. They found that in all cases, thumbnails that resembled a video performed better. Certain email autoresponders let you create this style of image within their dashboard! MailChimp has video merge tags that pull a thumbnail from a video hosted on one of the online platforms they support. The thumbnail visually resembles a video in every way, from the play button to the progress bar. Whether you do it yourself or use already available software, creating a graphic with a fake play button and a time bar can really impact your click rates. Once your thumbnail is ready and placed in your email, link it to the page your video is on. How this is done will depend on what software you’re using, but should be pretty easy (Google is your friend!) You can use a specific landing page or link directly to the platform where your video is hosted (i.e. YouTube, Vimeo, etc.) If you’ve made a video with Biteable, we’ve made it easy for you to post straight to YouTube. Which we linked to the following YouTube video promoting our new animated scenes. While this process is a little more cumbersome than simply embedding a video straight into the email, it does have a number of extra marketing benefits. 1. Control the message Using a separate landing page on your self-hosted website gives you more control over the user experience. You sent the video for a specific reason, whether it’s to build brand awareness, run a promotion or just share useful information. Sending the user to a landing page eliminates distraction and helps you enhance the message and include a stronger call to action. In their inbox, you’re competing with a bunch of other emails and tabs. On the landing page, you’ve captured their attention and have a chance to get your message across. 2. Access to better analytics Your email autoresponder or CRM tool lets you track certain actions like open rates and click-through rates. By guiding the visitor to a separate page, you can use the full power of Google Analytics and other marketing software like heatmaps to track your subscriber’s actions! And, from an SEO perspective, using a separate page helps search engines index your video correctly and increase your website’s rating! But how do I get them to click? Discussing the benefits of getting your email subscribers to open up that email and click through to watch the video is all well and good, but the big challenge is getting them to open the email in the first place! We’ve got a few tips to help you with that. Use the word video in the subject line. Even just saying “video” is a powerful thing. It increases the open rate of your emails by 19%. To get even more power, couple it with some of these great email headline tips. Beware coming across as spammy! According to Convince and Convert, 69% of email recipients classify an email as spam based on the title alone. To avoid that, use a clear, concise subject line and always deliver on its promise. Share the right video. Video isn’t just video. Every type and style of video has strengths and weaknesses and is appropriate for different circumstances. Make sure the video you’re sharing is right for this particular email. Keeps it short, sweet and to the point. This isn’t the time to share that one hour presentation you recorded. Fits in with your current email marketing goals. That way, you can measure the specific impact it has on your ROI and employ the same tactic again! Has viral qualities. While nothing can guarantee a video goes viral, most videos that do go viral share certain qualities. A viral video has a single point and conveys it in an entertaining manner. Uses a crystal clear call to action. Be clear with your viewers about what you want them to do once they’ve watched the video. Using a separate landing page on your self-hosted website gives you more control over the user experience. Your email autoresponder or CRM tool lets you track certain actions like open rates and click-through rates. Your email subscriber opened the email and began reading. Your graphic caught their attention and made them pause. Now you need to drive the message home! Tell them exactly why watching this video will help them achieve their goals. You know your customers. Identify one key point from the video that’ll really resonate with them and show the value they’ll gain by clicking. Include a value proposition-based CTA before and after the video to really increase the chance of a click! Video is an incredibly powerful form of content. It gets higher engagement rates across the board and often makes us drop what we’re doing to watch it. But, as with all your other marketing efforts, video works best when it fits with your whole marketing plan and helps you achieve specific goals. So before you use video in email, figure out what you want to gain and how you’ll measure the ROI. Once you know what you want, video email marketing can help you get it!